GO WHERE THE BUILDERS GO! Apollo XL is a stunning hybrid ﬂoor that can easily withstand the everyday wear and tear of busy family homes. Visit our showroom to design the kitchen of your dreams at a price you won’t believe! Australian Made cabinetries, Italian ﬁnishes, European appliances, ﬂat packed or installed! Shop where the builders shop! aster is upon us. Four days of uninterrupted bliss, family time and chocolate. These are the reasons it is one of my favourite weekends of the year. Traditionally, we spend Easter at home working through our to-do list of odd jobs that we just haven’t had time to complete. One year we re-designed the home office. On another Easter we built a retainer wall. This year will be a little different for our family. We are packing our bags and jetting north for a getaway. But, for those families who will be utilising the time to renovate or update, we have compiled a list of Easter weekend project ideas. Keeping in mind that the holiday is also a good time to rest and relax, we have kept the list short and sweet. 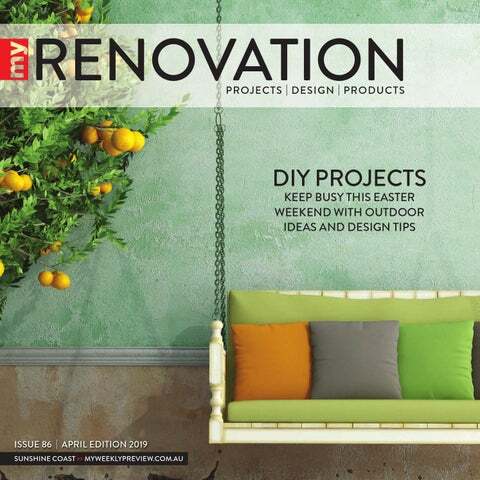 I’m confident there are plenty of ideas for all readers in this edition of My Renovation. From a security feature to style advice, and even a DIY cubby house project, we have been busy compiling ideas to keep you motivated and busy. Until next edition, happy renovating. Have a wonderful Easter! towards your holidays with Apollo To qualify, spend $5000 or more on an Apollo outdoor home addition! ^Approved applicants only. Fees, terms & conditions apply, incl $99 Annual Fee charged on the account open date and annually on the anniversary of that date. Annual Fee must be paid in full within 90 days or it will attract interest. Minimum monthly repayment required. Interest, (charged at the standard Expired Promotional Rate) payable on outstanding balance after any Interest Free term. See skyecard.com.au for current interest rates. Credit provided by FlexiCards Australia Pty Ltd ABN 31 099 651 877 Australian Credit Licence number 247415. Skye is a trademark of FlexiCards Australia Pty Ltd, a subsidiary of FlexiGroup Limited. 48 Months interest free minimum spend $1,600. Offer ends 30/04/19. †Apollo Durasheen paint finish with 15 year warranty. Photos are indicative only – Apollo Home Additions are individually designed and may vary from the photo. Construction by JTS Patio Constructions T/A Apollo Patios Brisbane & Sunshine Coast QBCC Licence No:15054065. JTS6199. EASTER WEEKEND PROJECTS Easter – the weekend of chocolate, family and fun. It also means you have four consecutive days to knock over those odd jobs that are piling up. The weather is cooler, everyone’s home, and there’s no better time to tackle those DIY projects. Here are five suggestions to keep you busy. Organise your office space Cleaning and organising the home office may seem like a dreaded and time-consuming task, but the initial effort you put into the project will return two-fold in productivity and creativity when it comes to work. Here are our tips for designing the ideal space: 1. Purge – You read that right – start with a big clean. Shred or recycle old paper work, books and documents that are no longer needed. 2. Clean – There is nothing like a good dust to make you feel good about a space. 3. Purpose – Think about who will use the office. Is it for a home business, or will the kids access the space too? This will give you direction when it comes to planning and fitting out the space. 4. Colour – The days of dull grey and white offices are gone. Inject a little personality with a splash of paint. 5. Style – This is the fun part. Choose furniture and accents that are practical, but that you also love. You want to create a welcoming room that encourages productivity. Update Don’t have time or budget for a major renovation? You’ll be surprised to know that a few little updates can make a big difference. We recommend replacing old door handles with modern ones. Consider what type of door knobs you need. Are locks a necessity? Do you want brass, silver, brushed or white handles? Be sure polished, bru enough to coordinate your entire to buy enoug home. New ttapware is also an effective way to update yo your home. • Awnings • Louvres • Shutters • Fencing & Gates • Insect & Security Screens All screens and gates are custom designed to suit your needs. Tip Style le flowers in ason jars for mason a pretty effect. PRODUCT ALERT P We lo love the Spin Brushed Brass range from B Highgrove Bathrooms. Hig Pic Pictured is the Round Goo Gooseneck Sink Mixer. Dining table love Although Christmas takes the crown when it comes to styling celebration tables, there is no reason you can’t go all out for Easter. Whether it’s a casual Good Friday barbecue or a sit-down Sunday lunch, you can turn your dining table into a festive statement. Our tip? You can never have too many flowers. Choose a colour theme and build from there. Tip Stihl recommends mowing the lawn once every three or four weeks at this time of year – no lower than 2.5 centimetres high. FREE UPGRADE Soft closing drawer system Conditions Apply. BEFORE Get outdoors We love Easter weather! It’s an ideal time to pull on some gardening gloves and head outside. Autumn is also a great time to plant colourful flowers. We like roses, orchids, daises, pansies and tibouchina plants. The experts at Stihl say that autumn is the perfect time to feed your lawn. Use a slow-release lawn food to encourage a stronger root system and thicker blades. This process will rejuvenate a tired lawn to ready it for the onset of cool winter weather. Flatpack versus custom Generally, kitchens are sold as modular units or custom built by craftsmen. Your budget will more than likely dictate the type of kitchen you choose. The popularity of flatpacks is on the rise. These budget-friendly units are packed and ready for the DIY renovator. They are available in a range of colours, styles and shapes and can be dressed up with the addition of quality appliances and sink fixtures. Measure up Before heading to the professionals be sure to measure up the kitchen space so that they can calculate costings. Even if it is just a rough estimate, it will help with budget planning. Style You will soon discover that the choices are endless when it comes to finding the right style cabinet for your home. What colour and materials do you want? The final selection will come down to your budget. Custom cabinets, which offer more options, will cost more, while standard cabinets are easier on your hip pocket. tip Soft-closing drawers may cost more, but they are a good investment. Purchase ones that come with a decent warranty. Budget right Kitchen renovations are expensive and the core of the cost comes down to the cabinetry. You should allocated between 45 and 50 cent of the kitchen budget to this portion of the project. Allow for good quality hinges and drawers, whereas save some dollars by opting for less expensive door and drawer handles. Prioritise What inclusions do you want? What size drawers and cupboards do you need? Will your baking trays fit into the allocated space? These are the questions you need to ask yourself when you begin planning your project. Carpet 3 Bedrooms from $1495 Fully installed on quality Dunlop Underlay. Based on 38m2. Purfect your flooring Pets play a big role in the lives of many families. They are cute, cuddly and loyal. The only downside is the impact they can have on your floors, especially if you are installing a new product. Even trimmed claws can scratch hardwood floors. Carpet Court has come up with the answer by releasing a new pet-friendly and scratch-proof hybrid timber flooring range. According to national merchandise manager Brett Talbot, the Pinnacle Collection from Stainmaster PetProtect has been engineered specifically for households with pets. “The Pinnacle range is durable, easy to maintain and is equipped with Clawshield and ActionTraction technology,’’ he says. “The floor is able to resist scratching from an 80-kilogram great dane and is non-slip, so your pets can roughhouse and run to their hearts’ content without damaging the floor or their joints.” The flooring is also waterproof and resists absorption of stains and odours. Pictured is the Classic Chestnut. The product The Pinnacle collection is available in eight wooden colours, comes with a lifetime residential warranty and is priced at $59.90 per square metre (supply only, excluding installation costs). Cleaning tips for pet lovers • After you’ve blotted the wet area, spray with an enzymebased solution (vinegar and water) to neutralise the smell. Leave for 10 minutes and blot with paper towel. • Never wash affected carpet areas with regular soap or cleaning products – if applied immediately after the enzyme treatment this will deactivate the neutralisation process (meaning the smell will remain). Additionally, cleaning products can permanently stain your carpet. • Do not clean floorboards with ammonia-based products as the smell can attract your pets to mark the area. • Do not use a steam mop to clean floorboards. • Never rub or scrub the stain as it can result in fuzzy carpet areas. • Do not immediately use a steam cleaner on the affected carpet area, as this can embed the stain and smell into your carpet fibres. For an investment with rental potential or a family member to live with you We are available at any time to inspect your site and provide you with a quotation including initial concept sketches and floor plans. Contact Granny Flats SEQ today! CALL TODAY FOR AN INSPECTION OF YOUR SITE! On alert It’s easy to get caught up in the planning, designing and styling elements of a renovation project, but equally as important is an investment in security. In terms of residential requirements, security needs range from correct lighting through to locks, screens, windows, visibility and alarm systems. Take your time to investigate options to ensure your home is safe and secure. Outdoors One of the most obvious security measures is outdoor lighting. Consider the best locations to install your lighting, taking into consideration dim and dark areas of the yard. High-mounted floodlights and low-level path lights are a good option. It is also worth installing motion-sensor lighting. PRODUCT ALERT The Sensor Flood with LED allows light to be directed to where it is required. It’s ideal for lighting up outdoor pathways around the exterior of your home. It’s from Andrew’s Light Up. LOCK UP Australian insurance agency Suncorp says there is a reason insurers ask if your home’s external doors are secured with a deadlock – they are stronger than a door with a chain lock and offer more protection from intruders. Security doors are also a priority when warding off unwanted intruders. One to buy The Screenguard stainless steel mesh security system was designed to protect your home. The patented systems have been put to the test and pass the latest rigid Australian standards, which are designed to simulate an intense attack using force to gain entry through your security screen door or window. Screenguard aluminium frames use T6-grade, high-tensile extruded aluminium to ensure strength and quality. The anti-corrosive stainless steel wire mesh is coated with a UV protected coating using advanced processes to ensure clear, long lasting looks. The product is available from a range of stores including Harlequin Blinds and Security and Tilbrook Blinds, Awnings and Shutters. Perhaps you are going away or in need of extra security checks? East Coast Security provides mobile patrols on the Sunshine Coast. They provide night and day security patrols and lock-up services. Blockout blinds are great for bedrooms and lounge rooms for privacy and reduced sunlight. Block out Everyone enjoys their privacy. One of the most common places people seek privacy is in their own homes or even offices. The protection of valuables is also important. Items inside your home or office will usually need to be protected from the view of prying eyes. The team at Image Blinds says window treatments will provide the privacy and valuable protection you need, but will also offer lighting and temperature control. There are many different types of blinds available to suit every style of home and preference of each individual home owner. If you like the look of venetian blinds then you are sure to find one that suits from a range of timber or aluminium venetians. You could also consider roller blinds or vertical drapes. Depending on where the vertical or roller blinds are to be placed will depend on the material you choose. Security windows The experts at Alpha Screens and Glass say stainless steel security screens provide the most effective security in comparison to other screening products on the market. Stainless steel screens have become increasingly popular as they look like a flyscreen, but have the strength of stainless steel. This means that your view is not obscured by cross bars and you can rest assured that these screens have consistently surpassed Australian standards testing. PRODUCT ALERT We love the aluminium doors from Home & Renovators Warehouse. Powder-coated aluminium doors are low maintenance and durable in situations exposed to harsh weather. All doors come powder coated in your choice of colour, or even a timber-look coating. Thermtek doors offer that additional benefit of insulation and provide excellent sound suppression. *OFFER ENDS 13TH APRIL 2019. CONDITIONS APPLY. Is the most important room in home looking like the worst? Transform your kitchen with replacement doors, drawer fronts, benchtop and splashback. SAVE - on the cost of a new kitchen by keeping existing cabinetry/layout. AUSTRALIAN MADE – doors and cabinets plus a 10 year warranty of products and workmanship warranty. Ask about our New Year specials for guaranteed February installation. A kitchen facelift can save you heaps while giving you a kitchen that looks and feels brand new. project, we simply had to lift the pavers to lay turf. Unfortunately, under these pavers we discovered old cement paths and concrete patches that needed to be cut and dug out. This added thousands to the cost of the job. If you suspect your home renovation project might face one of these issues, be prepared to allocate more to your contingency budget. About 30 per cent should cover it. Keep in mind that rectifying these hidden issues not only takes money, but also time. Be prepared to have to stop work to resolve any issues. Ignoring issues that arise might seem like an easy way to save time and money, but it will come back to haunt you. Cutting corners usually leads to increased maintenance down the track. My advice? Go into your reno half expecting something to go wrong and be prepared to tackle any issues. PLAN AHEAD Inheriting problems from past renos might add huge costs to what might initially seem like an easy job. A simple job of lifting pavers to lay turf caused costly problems in this home project due to underlying concrete paths. Create your own slice of island-life paradise, taking relaxed style cues from Kyal and Kara’s Long Jetty home. / Good vibes only Decorate your home with the little things that make you smile. Display the keepsakes from your travels, your childhood and good times to bring back happy memories. Stay neutral Pale grey, cream and blue tones on walls allow accent colours and statement pieces to pop. / Clutter free finish Only display important items that simplify or enhance your daily routines – plants, pillows, books – and anything else that makes you happy. Winning style We’re thrilled to have Kara and Kyal Demmrich onboard as our style ambassadors. With 35 renovations under their belt – including Channel 9’s The Block: Fans v Faves – this dynamic, down-to-earth duo knows a thing or two about making homes more beautiful. Plus win a styling session with expert stylist Kara Demmrich (The Living Room & The Block: Fans v Faves) *Visit website for details on how to enter and a full list of terms and conditions. Free Interior Design Consultation Create the look you’re dreaming of with our expert interior stylist, Maureen Walters. Visit maroochydorehomemakercentre.com.au for all details. GET CREATIVE Get your kids to enjoy the outdoors by creating a space in the backyard for them to play and explore. Cubby houses have been a staple item in many Australian homes over generations. However, with being constantly exposed to the elements, many are neglected, run-down and long-forgotten, as well as devoid of colour and character. Dulux Colour Expert Andrea Lucena-Orr says injecting some personality into your cubby house is a fun process. “Choosing the right colours doesn’t have to be hard – create some punchy and fun schemes that will complement the look and feel of your yard and let your kids have a say – after all, the cubby’s colours must excite and ignite their passion to play in the space,” she says. Whether you are painting a multi-storey cubby, or a quaint one room with a window, the right colours and accessories will turn your run-of-themill cubby into a kid’s outdoor retreat. Here are Dulux’s tips. TRANQUIL NEW B O TA N I C S Carpet Court has the latest trends and styles in store now. CUBBY HOUSE 1. Gather your painting supplies – Dulux Weathershield in your chosen colours, drop sheet, high quality synthetic brush for cutting in, medium nap roller, roller tray, 400 grit sandpaper, painter’s tape, old cloths. ACCESSORISE Once your project is complete, get the kids involved in planning the final touches. Do you want to hang bunting or install a cute mailbox or sign? Furniture is also a great idea. 2. Ensure the surface has been properly prepared prior to starting to paint. Follow the label on the can for more information. 3. Start painting by cutting in around the edges and hard to reach areas using Dulux Weathershield. 4. For best results, begin at the top and work your way down. Paint the underside of your boards then the face. Use long strokes in horizontal motions from one side to the other. As a tip – never stop halfway along the board and return to it later or you’ll create an overlapping of paint which is difficult to correct. Allow to dry for two hours. 5. Give the surface a light sand with 400 grit sandpaper and repeat steps four for a second coat. If painting bare timber, a third coat will need to be applied. PICNIC TABLE 1. After sanding down the surface, apply one coat of Dulux 1Step Prep. 2. Start painting by cutting in around the edges of the furniture piece using Dulux Aquanamel. 3. Apply paint to the surface using short, horizontal brush strokes. 4. While the paint is still wet, smooth over the painted section with long brush strokes and without reloading the brush – a few strokes should be enough to smooth the surface. 5. Use a roller to paint in the middle section, if required. 6. Allow to dry for two hours then give the surface a light sand with 400 grit sandpaper and repeat steps four and five for a second coat. Cassandra Fenaughty is a landscape architect with more than 20 years’ experience. She’s the founder and owner of an innovative new renovation design consultancy, creating photo-real renovation concepts for clients looking to visualise their dream renovation before it begins. For more visit cassandrafenaughty.com. KITCHENS AND CABINETRY MADE EASY! CUSTOM DESIGNED - FLAT PACK OR INSTALLED • Quality craftsmanship made with the material you want • A price difference you just won’t beat when compared to a custom fitted kitchen • Our team of specialists will even come and install it! of materials that vary in cost, quality and longevity. If installed internally they can usually be wiped down easily with a wet cloth, which is important in a kitchen area. Internal blinds: Roller blinds and Roman blinds are also used in kitchens but are harder to keep clean. They also pose a fire risk. If you decide to choose one of these options make sure you select a product that has a fabric with a coating that is easy to clean, mould resistant and preferably a low fire danger, possibly with a fire-retardant treatment. You will need to look at complimentary colours for the window coverings, depending on if you choose external or internal treatments. White is best for plantation shutters. You could choose white or grey tones for roller blinds. This will match most colour schemes, especially if your kitchen is already colourful. An external blind should complement the external colour scheme of your home. Thanks again Sue and best of luck! How to transform your courtyard ing space is a An outdoor liv mes to must when it co ing. Here are Queensland liv lp transform he a few ideas to your space. Colour A feature colour is key. Choosing the colour is an important first step, as all subsequent decisions will hinge on this one. Deck the floors If your space has stained or aging concrete, one way you can update the flooring is by constructing a deck. Timber is a natural material that will warm up your outdoor area and give it new life. Decking is also strong and durable. Hide it Does your courtyard feature an original external wall that is in need of some love? If you are not completing a structural renovation, there are other ways to correct the issue. Hide original walls with a variety of natural and manmade screens including bamboo, crawling vines or patterned panelling. NON SLIP SURFACES Epoxy floors are seamless and extremely abrasion resistant. Making it the ideal concrete surface treatment when durability, resistance to heavy foot traffic and minimal maintenance is important. Quality Decorative & Stencilled Concrete Looks great, low maintenance and adds value to your home We’ll take on any concreting job big or small so now’s the time to get your driveway done or perhaps create a new entertainment area! Domestic & Commerical. We’re your concreting specialists! IMAGINE IF YOU COULD….. order your screen or gate and have it available to you within 48 hours Well you can at Blitz Screens! This Australian made product with a 10 year warranty is available locally on the Sunshine Coast and can be available in 48 hours. Installation or DIY solutions available. Pots and plants Use a wide range of plants including large-leaved tropical plants to herbs, bromeliads and flowering varieties. When it comes to selecting pots, mix and match, but find a common thread in the way of colour or texture to ensure a cohesive finish. GARDENING TIPS • Do your research before choosing plants – talk to the gardening experts. • Choose climate appropriate plants. • Include a range of plants – flowering varieties as well as green foliage. • When buying flower bulbs, check they’re healthy. • Save money by buying smaller plants. www.blitzglass.com.au • Creative all-inclusive 3D design. • Detailed and itemised quotes without hidden extras. • Quality equipment and ﬁnishes on every project. • Professional project management and communication. • Personal service from concept to completion with our unique 6 tier guarantee. • Celebrating 40 years in business on the Sunshine Coast. • Build with the industry professionals and let us show you the future of pool building. • Contact us today for a free onsite design consultation for your project. finishing touches Advice and ideas to turn your renovation into a home. EASTER STYLING This holiday conjures up thoughts of pastel decorations, fresh flowers and cute bunnies. Why not turn your home into a festive Easter wonderland? The kids will love it, and your guests will be impressed. PERFECT SETTING Weâ&#x20AC;&#x2122;ll use any excuse to invest in a new table setting. The Cleo range from Domayne, with its bevelled design and bright colour, features a contemporary twist on a traditional piece of glassware. Visit Domayne at the Maroochydore Homemaker Centre. WE LOVE! The hand-crafted Easter Standing Glass Eggs from Adairs. The largest range of upholstery, fabrics & curtains on the Sunshine Coast Our talented design team can help you create beautiful interiors. Our showrooms offer an extensive range of fabrics, window treatments and soft furnishings, together with a wide selection of exclusive furniture, one-off design pieces and original works. DIY PROJECT Get the kids involved in a fun Easter project. Not only is this pencil vase practical and fun, but it injects a little personality into your holiday table setting. PRODUCT ALERT Styling your dining table for your Easter event not only looks great, but it’s a fun project. Choose a colour and theme and go from there. We love soft blues, buttercream and pale yellow hues. The Dampier bowl in duck egg blue is perfect for the occasion. It is made from tin and glazed in lead-free powder=coated enamel. It’s from Provincial Home Living at Sunshine Coast Home. THE DECORATIONS Featuring cute splatter detail, the Mercer + Reid Easter Speckle Eggs are the ideal decoration for your home this Easter. The pack comes with four white and four mintcoloured eggs. Visit Adairs, Sunshine Coast Home in Maroochydore. SPLASH OF COLOUR If you want your flower arrangement to last, opt for faux over fresh. The Muse Tulip Pick in Vase from Pillowtalk is one stylish option. STYLE TO SUIT Interior design trends are seasonal and sometimes it can be hard to keep up. This is why it’s important to inject your own personality into your home. Whether that style is quirky or classy, be authentic and stick to what yyou love. The renovation industry on the Sunshine Coast is big business business, accounting for the majority of residential building activity since 2016. 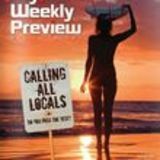 Published monthly, and the only publication of its type on the Coast, My Renovation is inserted in My Weekly Preview and distributed to 56,000 homes. It is a must if your business is targeting the many thousands of home renovators across the region. PAINT IT Make a bold statement with this artwork from Empty Canvas, Mooloolaba. Innovative Furnishings and Décor in Mooloolaba has a large range of cushions including this rectangle variety. STORAGE OPTIONS Short on storage? Cupboards aren’t the only answer. Invest in shelves and baskets that you love. This one is from May and Brant Fashion and Living, Bli Bli.